England thrashed Czech Republic 5-0 as Wembley last night, as Gareth Southgate’s side got their Euro 2020 qualifying campaign off to a flyer. Goals from Harry Kane, Raheem Sterling (x3) and an own goal from Tomas Kalas proved to be the difference the between the two sides in the end, as the Three Lions put their mark down on group A in style. 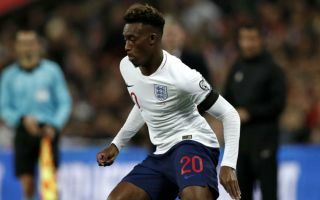 It was an exciting match from an England fan’s perspective, with stars like Jadon Sancho, Raheem Sterling and Callum Hudson-Odoi all impressing with their performances. Although he didn’t start, Hudson-Odoi still managed to get a few minutes under his belt, as the Chelsea ace was brought on with 20 minutes to go. And it was this substitution in which England history was made, as Hudson-Odoi became the youngest player in the nation’s history to win his first competitive cap according to Opta. It was a huge night for Hudson-Odoi, who managed to show exactly why loads of Chelsea fans are desperate to see him start for their club. The 18-year-old bagged an assist in the second half, as a mazy run ended up with him firing a shot at goal, with the rebound being put into his own net by Kalas.